Sanely is the current champion. 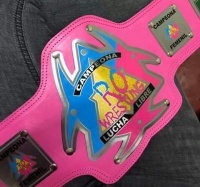 She won the championship on November 24, 2018 by defeating Bastet, Dalys, Lilith Dark, Princesa Azul, & Princesa Sugehit at Arena San Juan Pantitlan. ROW introduced their first women's title. In order to crown the first champion there was a 6 woman way match on November 24, 2018. The winner and first champion was Sanely. This page was last edited on 16 February 2019, at 20:06.